Destructor is a driving game that requires the Expansion Module #2 steering wheel. 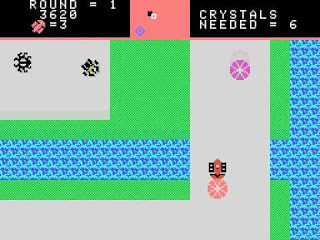 You control a Ram-Car and your mission is to collect an increasing number of crystals by ramming Krystaloids and depositing them into your starcruiser. Danger comes in the form of accidentally driving into the water, or by being captured by the deadly Insektoids that can only be killed by firing a crystal in their direction. The action has somewhat of an adventure feel, which is initially exciting in terms of being able to explore the expansive surroundings. In theory, this means you can scope out the best route in each level and strategically plan your attacks. However, the problem is that enemies randomly generate, and considering there's no timer, your best bet is to circle the starcruiser so the drop-off point is as close as possible. The controls are a real nuisance and the steering wheel's lack of a centre position means it's easy to over-steer, resulting in frequent water deaths. The other issue is the choppy scrolling and the fact that you need to be 3/4 towards the edge of the screen for it to move; this impacts the action in later levels, as often you won't see enemies until they're basically on top of you. I do like the map at the top of the screen though, as it stops you from wandering around aimlessly. There's also a neat mechanic whereby you can build a wall of crystals to block incoming enemies from attacking you, and later on there's some intense night missions that build paranoia due to your lack of vision. The level design appears to be randomised too which is a great idea. Unfortunately though, the collect-a-thon style gameplay grows tiresome after a couple of levels and boredom quickly sets in. Destructor is an interesting concept with tons of potential, but unfortunately the imprecise controls and monotonous gameplay leave a lot to be desired. Try it if you're looking for something different, but in my opinion Bump 'n' Jump (1984) and Turbo (1982) do a much better job of showcasing the awesome steering wheel accessory. Random trivia: A homebrew version is available that allows you to use a standard Colecovision controller.